UEFA Champions League 2015 Quarter final draw has been made and FC Barcelona will be taking on Paris Saint Germain for the second time in this years champions League. Both teams were in the same group earlier in the competition where both teams won their home ties against each other. Barcelona finished top of the group with 5 points while PSG were second with 13 points. 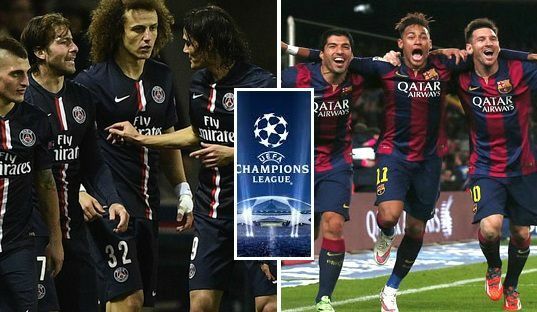 Now PSG will host Barcelona for the first leg of their 2015 champions league quarter final which means Barcelona have a slight advantage of playing second leg at home (camp Nou, Barcelona). The first leg game will be played on 14th April 2015 at Parc des Princes in Paris while the second leg will take place in Camp Nou, Barcelona a week later on 22 April 2015. Both teams has already meet twice earlier in the season where PSG won 3-2 at home while Barcelona won 3-1 at camp nou. While back in 2013 Barcelona played PSG in the quarter final stage abd got through on away goals rule as Barcelona drew 1-1 at home while there was another draw to follow with scoreline of 2-2 in paris which meant Barcelona went through on away goals rule. PSG will take heart from their recent performances against Barcelona they outplayed them earlier in the season winning 3-2 in Paris in a game which was full of drama. PSG defeated Chelsea in the round of 16 match having draw 1-1 at home and another 2-2 draw at stamford Bridge sealed their passage to the next round. How to watch PSG vs Barcelona Live online ? We will be placing live streaming links for all the champions league matches at totalsportek, keep checking back for more information ahead of the quarter final dates. Plus full match highlights and goals videos will also be available.